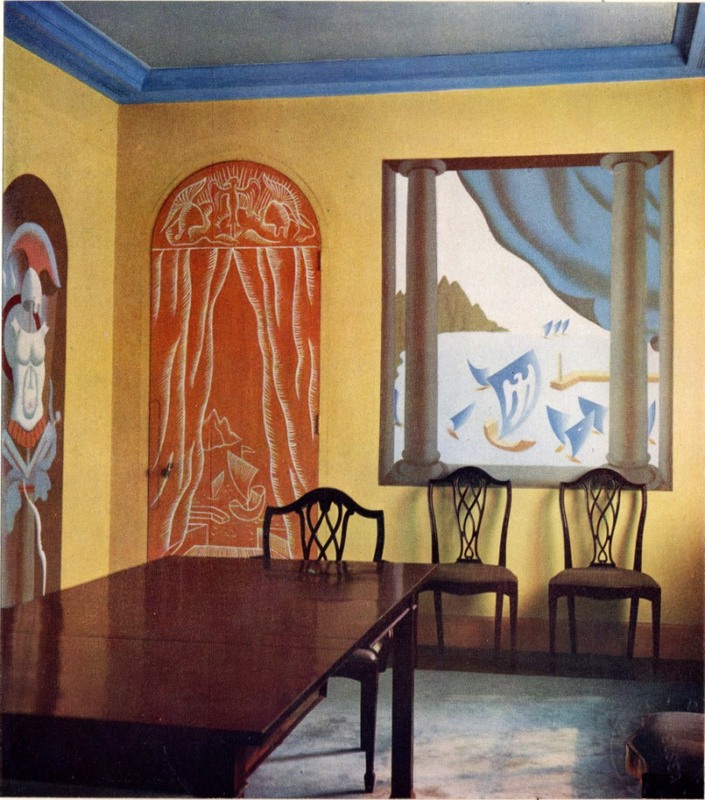 In one of the oldest houses in Chelsea, Syrie Maugham (wife of the best selling author Somerset Maugham) created a modern room. 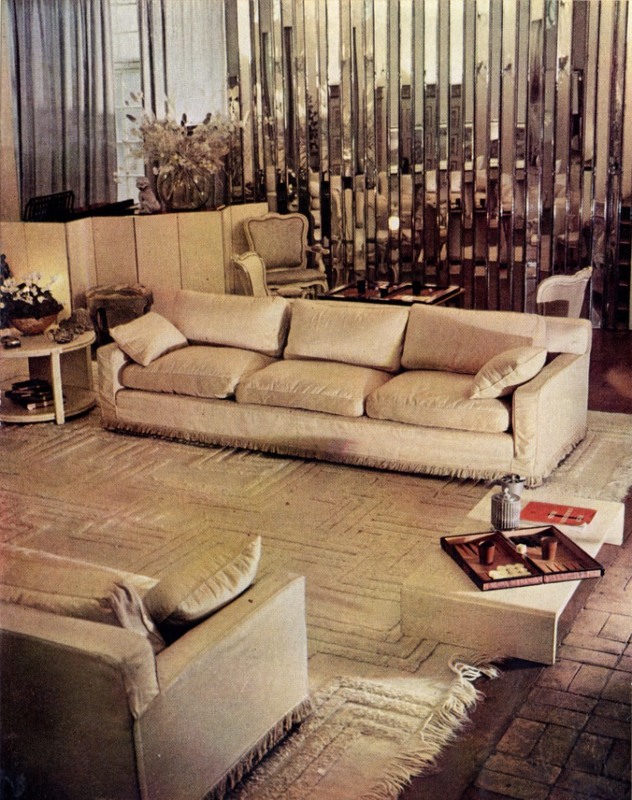 This was the white room, a space entirely furnished in shades of white. It was the first of its kind. 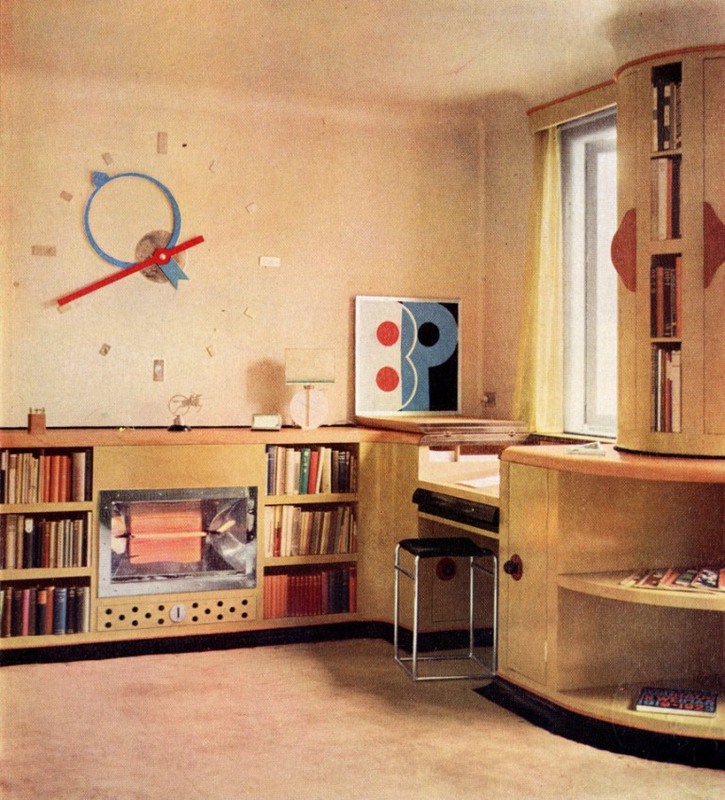 In the age of modernism, along with the revolutions in art, architecture, literature, music and dance, interior designers – the professionals and the amateurs had their own slant on modernism. They didn’t stick with white though. Here in this study room by Rodney Thomas are more pale walls and curved fittings, with some colorful touches,the most dramatic feature being the oversize clock. 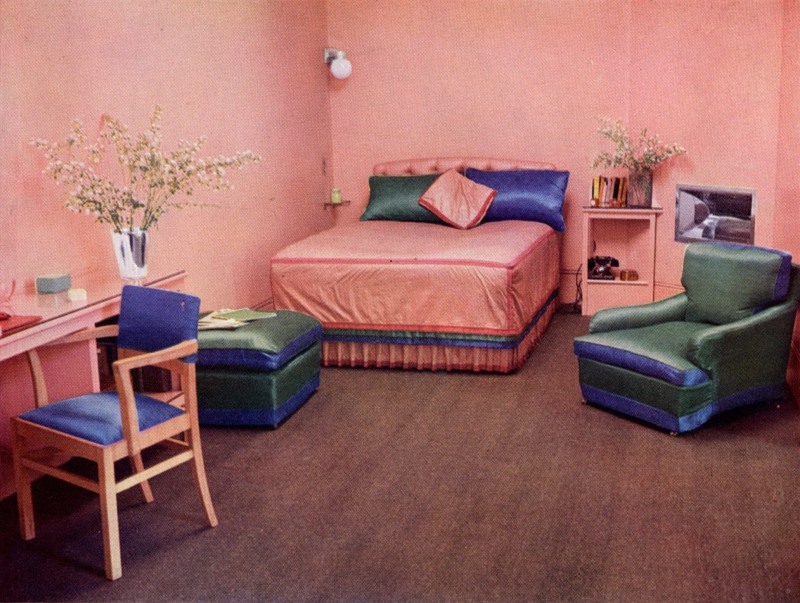 These rooms were designed for a “modern” form of life. I don’t know if the term lifestyle was in general use then but if not it should have been. 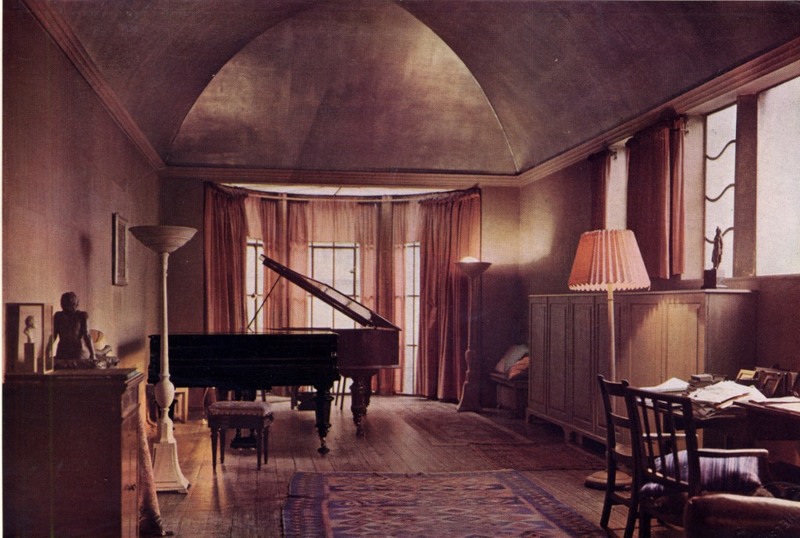 There was still room for the traditional activities of upper middle class life though, as in this music room. 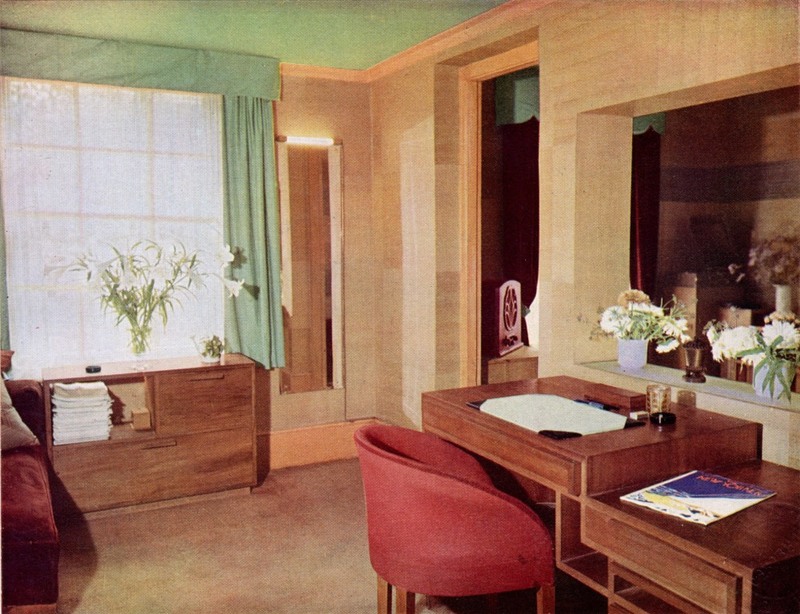 The colour scheme is more sombre but the room still retains that uncluttered look the 30s designers were aiming for. Last week I mentioned the hope of the Edwardians for the future. The early thirties were also optimistic in their way. Despite the Great War, the Depression and the ominous political developments in Europe these rooms also seem to me to reflect a hope for a future of technological and social advances. 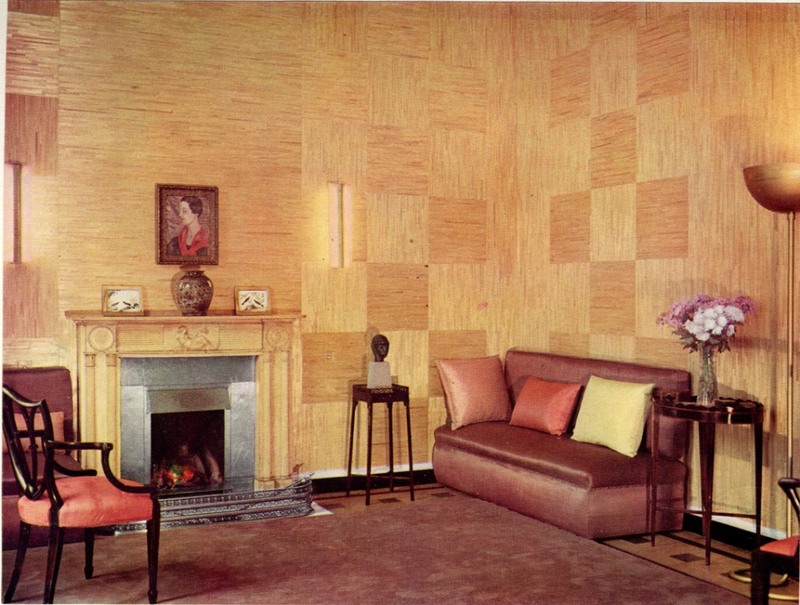 The wall covering in this room by Ronald Fleming is constructed of squares of gold coloured straw paper arranged to make a pattern like wood veneers. 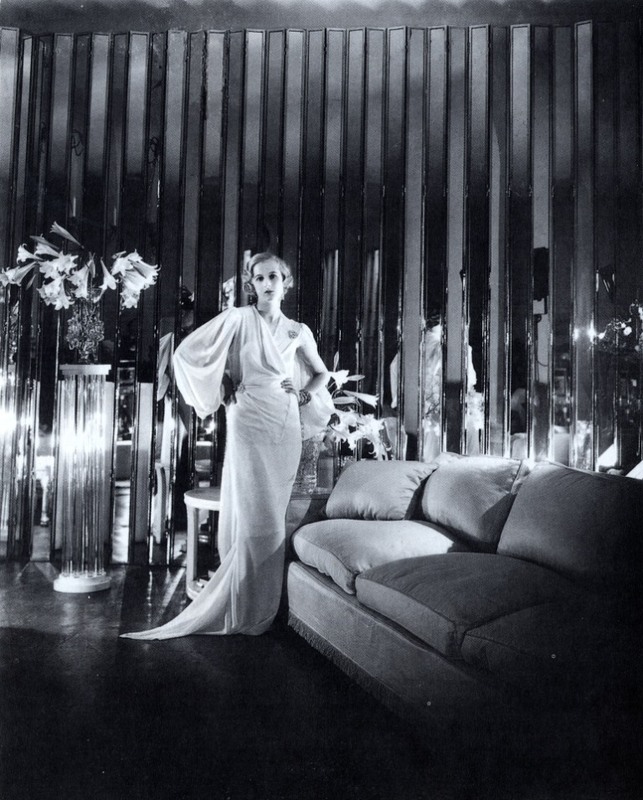 At her showroom in Sloane Street Betty Joel was presenting some flamboyant new designs in furniture and carpets. 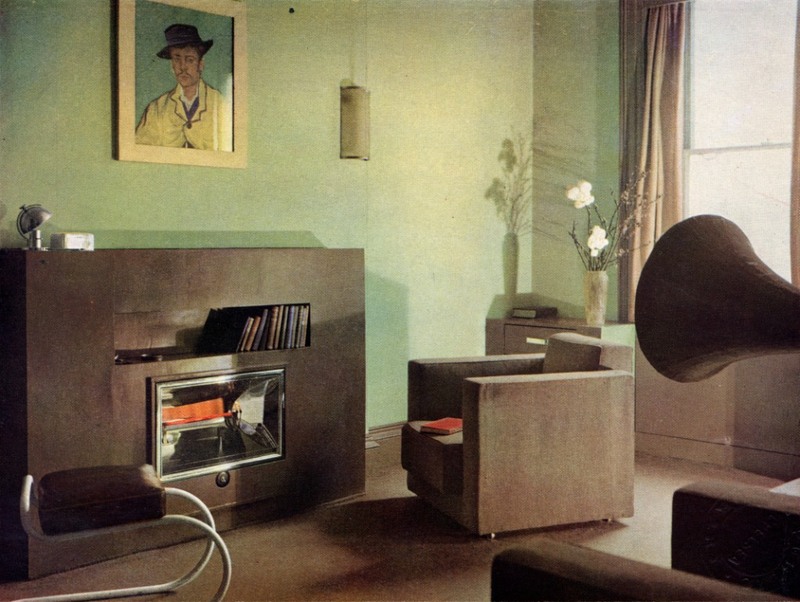 But note the horn of a gramophone player among the geometric lines of the furniture in this Ronald Dickens living room. Throughout these rooms there have been artworks on the walls showing how the designers were allied with the artists of the day. This one was designed by Derek Patmore. 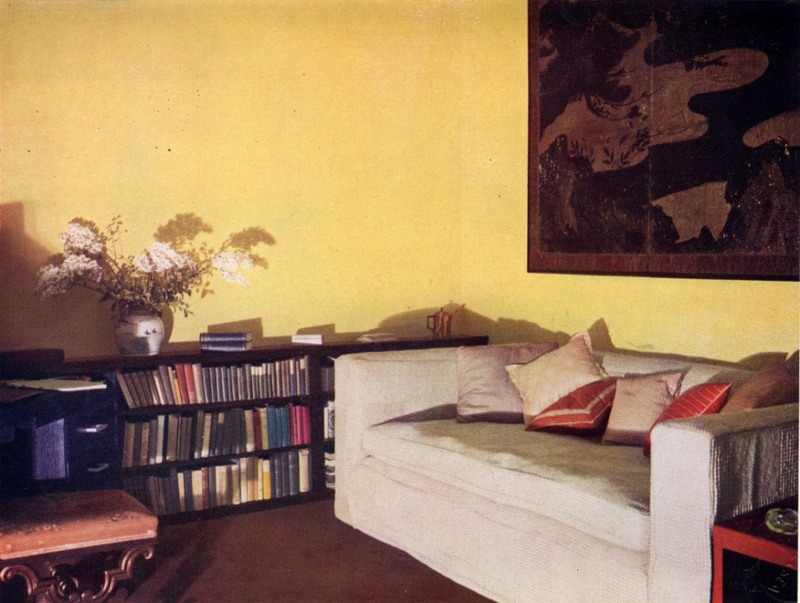 This week’s pictures come mostly from a book by Derek Patmore called Colour Schemes for the Modern Home, a 1934 survey of current trends in interior design. They capture a fleeting moment of a quiet revolution in taste as ideas of modernity were changing into forms we still see today. A bit of a change of pace for us after a month of transport related posts. 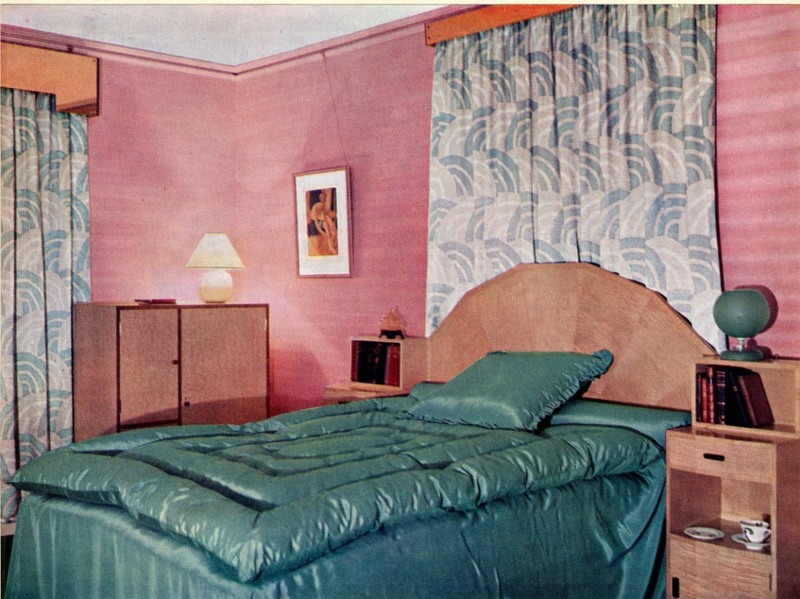 As you have no doubt realised I’m not an expert on the history of interior design. But I’ve always found these pictures fascinating which is reason enough for showing them here. 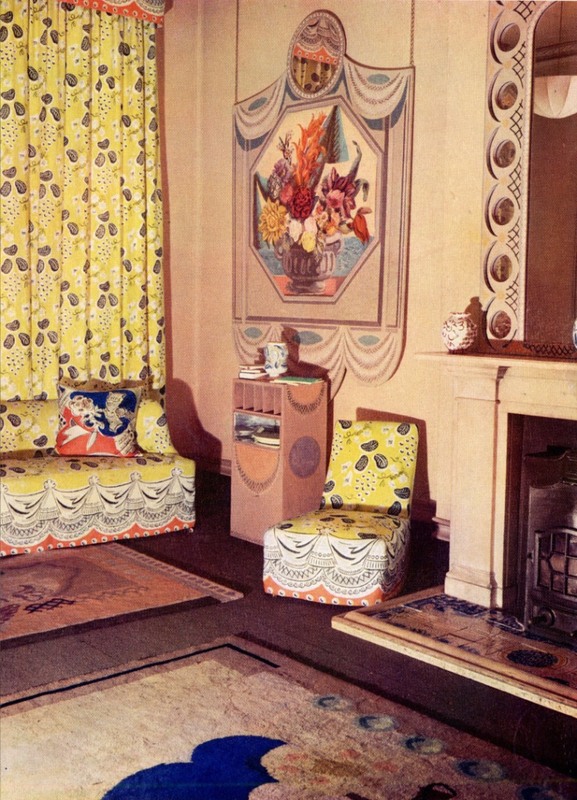 The picture of Nancy Beaton is from Stephen Calloway’s book Twentieth-century decoration : the domestic interior from 1900 to the present day. 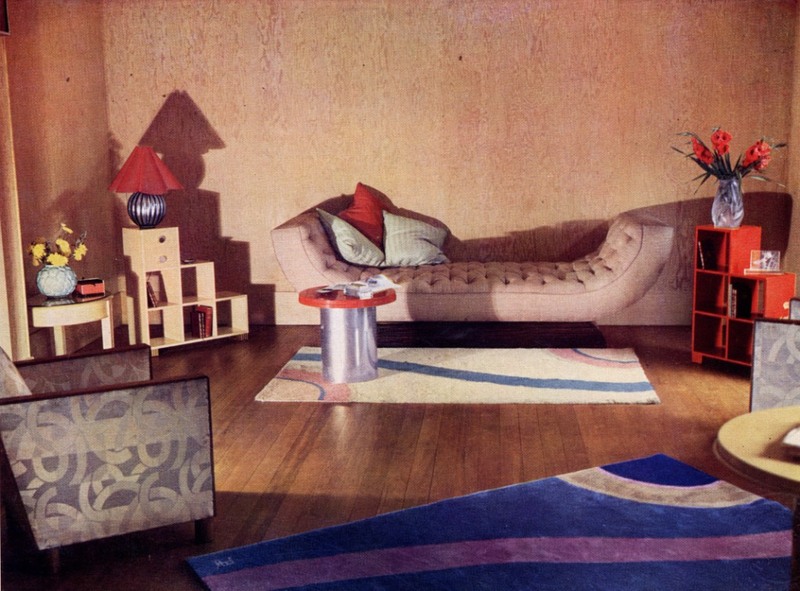 This is the first in a short series of posts about interiors. Next week’s pictures will provide a dramatic contrast. 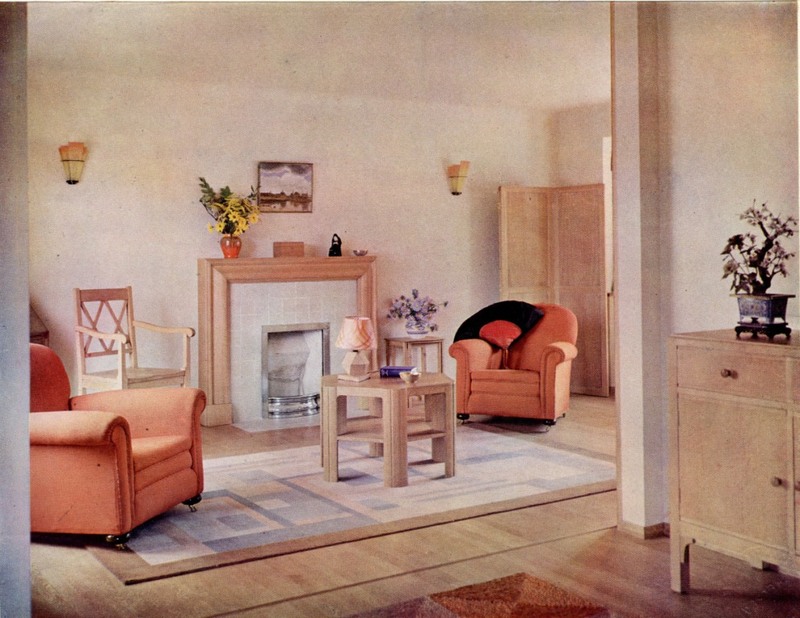 This entry was posted on Thursday, May 9th, 2013 at 12:02 am	and tagged with Betty Joel, Chelsea, Derek Patmore, Photographs, Syrie Maugham and posted in 20th Century, Chelsea, Interiors. You can follow any responses to this entry through the RSS 2.0 feed. I was expecting black curtains too! Thanks Dave. Wonderful photos. They did have taste. Pity the 1930s was such a fraught decade! 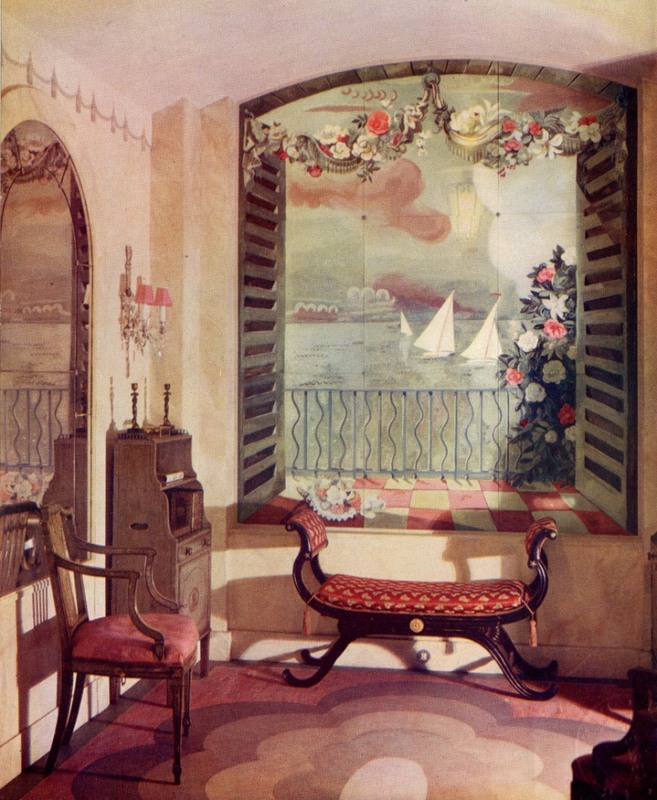 But I saw this: https://vimeo.com/7638752 — color film footage of London in 1927 by Claude Frisse-Greene — and when it got to Kensington? I just had to come over here to link it for you. If you hadn’t seen it yet, I thought you’d find it as fascinating as I do. Moreso, actually, as for me? It’s all a dream across an ocean.